Is government debt a burden for future generations? or the paradox of the last generation. 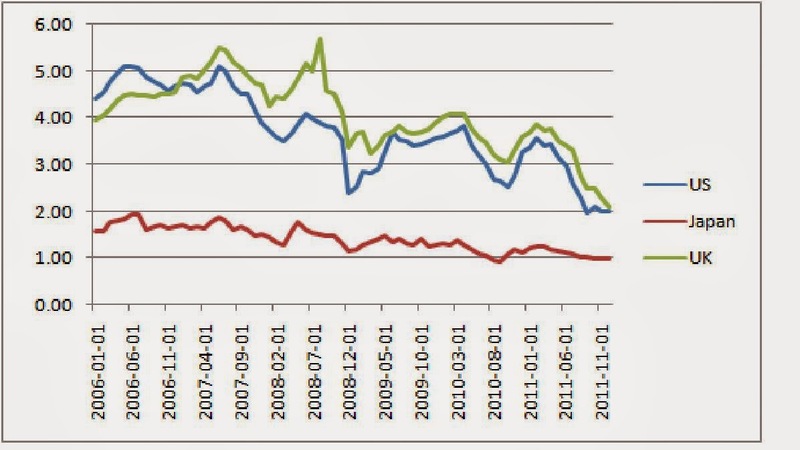 Paul Krugman has a nice post which is entitled ‘Debt Is (Mostly) money we owe to ourselves’. It is a point I have often used in the past to help students understand that macroeconomics is different from microeconomics. Government debt appears to be a ‘burden’ on taxpayers because the government must raise taxes to pay the interest on the debt. But if the debt is owned by the same taxpayers, the interest goes to them, so in income terms they are no worse off. However, I think the idea can be pushed too far. I do think it is reasonable to describe excess government debt as a burden for future generations. Before exploring this, we should note two factors that are very important but which we will ignore here. First, taxes will be raised in a way that distorts incentives, which has costs. Second, government debt can displace saving that go to produce capital, which reduces investment and the capital stock, which also reduces output. There is a lot more to say on both counts, maybe for another time. I ignore them here, because I want to focus on income flows at the aggregate level. What is the source of this paradox? Well imagine the debt is no longer a perpetuity, but has to be repaid after a thousand years. To repay the debt, the government raises taxes. The generation paying taxes in a thousand years time loses out in a major way – their income decline matches the gain received by the tax cut generation. The paradox disappears. So the paradox arises if there is no last generation that has to repay the debt. The same paradox arises with an unfunded social security scheme. This is where a government creates a pension scheme whereby pensions are paid using the contributions of those working. When the scheme is introduced, those who are just retiring are much better off: they get a pension ‘for free’. But those who pay into the pension scheme get their money back when they retire, so to the first approximation they are no worse off. (It is an approximation because we should worry about the return they get on this ‘forced saving’, but the important point here is that they get their contributions back.) Once again, we have a free lunch, but only because the pension scheme never comes to an end. If it did end, the last generation would pay contributions when working but receive no pension, so their loss would ‘match’ the gain of the retired when the scheme was introduced. So it is possible that government debt need not be a burden on future generations, if it is never repaid. However, this is not a very realistic or sensible assumption. My own view is that it makes sense for governments to have a long run target for debt, and in that case any excess debt beyond this target will eventually have to be repaid. If that is the case, then additional debt incurred now is a burden on future generations, because they will in practice repay it (as the government slowly moves debt back towards its target). Should this make those of us who advocate stimulus rather than austerity today think again? No – because the overall benefits still outweigh the costs. Would we really want to argue that expansionary fiscal policy should not have been used to avoid the Great Depression of the 1930s because it would mean we would be paying slightly higher taxes today? Of course not. There, but for austerity, go us? This line, which has been (and will be) repeated over and over again, has power – until we take a look at the evidence. This chart compares the UK to the US and Japan. I’ve chosen those countries because they dispel two common myths about interest rates on government debt. One is that UK rates have been falling because the UK has undertaken clear action to rapidly control debt. Compare with the US, where political stalemate and uncertainty is endemic, and attempts at fiscal stimulus are being made. Yet it is not the case that UK rates have been falling and US rates rising. The second is that debt in the UK was reaching critical levels: we were ‘on the brink’ to quote Clegg. Government debt is twice the size of GDP in Japan, whereas debt in the UK is well below annual GDP, yet interest rates on Japanese debt are lower and have also been falling. Of course we could always argue that the US and Japan had special characteristics, until we note that interest rates have been falling pretty well everywhere except the Euro area: Australia, New Zealand, Canada, the Czech Republic, Iceland, Japan, South Korea, Norway, Sweden, Switzerland, the U.K. and the U.S. The one area that clearly is special is the Eurozone. It is special because the ECB has not (Greece) and may not print money to avoid default in individual Eurozone countries. What is noticeable about this chart is how correlated these interest rates are. In part this is because interest rates have been responding to the same thing: perceptions about future growth in the global economy. The deterioration in the prospects for global growth during 2011 implies central banks will keep short term rates near zero for longer, which in turn implies lower rates on longer term assets like government debt. What lower growth prospects do not imply in the US, UK or most other countries with their own currency is an increase in the risk of default. The opposite is the case in the Euro area, which is why it is the exception. So next time this line is trotted out, please will someone say: but the Eurozone economies are different, because they do not have their own central banks. So far I’ve managed to blog at more than the frequency I intended, by just writing about things that arose naturally from whatever I was doing. So what to write when I am, along with most, preoccupied with Christmas? As a macroeconomist, you might imagine that I would be wondering whether Christmas shopping will be enough this year to prevent a double dip recession, or something like that. But whenever I see crowds Christmas shopping, I think of the following paper: Waldfogel, J (1993) ‘The Deadweight Loss of Christmas’ American Economic Review Vol. 83 pp. 1328-1336. Predictably for an economist, this paper tries to calculate the amount that is wasted by people trying to guess what other people might like, and getting it wrong. We all know this happens – look at the queues at return desks in early January. The paper estimates that between a tenth and a third of gifts are wasted (or more precisely, the average $10 gift is worth at best $9 to the recipient). What is more, there is the time spent trying to decide what to give. Sometimes people drop hints – but in June, not December, and you have to write it down somewhere, and then worry that by now they might have bought it for themselves. So far, so Scrooge like. The economist's answer is of course to give cash (deadweight loss = 0), or just ask people precisely what they want. But cash kind of misses the point, and when I’m asked what I want for Christmas my mind goes blank. Yet we now have the tool to reduce this loss dramatically: the wishlist posted somewhere on the web. If this is kept up throughout the year, it can largely eliminate deadweight loss, and maintain an element of surprise. In this context I thought about Tyler Cowen’s book The Great Stagnation. One of the ideas here is that the period of rapid technological innovation has past. Compared to the burst of innovation in the decades around 1900, in the last few we really only have the computer and the internet. This may be right, but the benefits of the internet are pervasive, and some – like this one – will not show up in GDP, but are important nevertheless. Merry Christmas! In a previous post I looked at the evidence that there was a competitiveness crisis in the Eurozone as well as a debt crisis. I concluded that it is plausible that Germany is now too competitive (its real exchange rate is undervalued), and that other Eurozone countries may have to experience a period of stagnation to correct this. If this is true, an obvious question is how this happened. One simple story is that the formation of the Euro reduced real interest rates in a number of countries, which provided a large stimulus to demand, and also helped generate housing bubbles in some countries. A related story is the rapid expansion in cross border lending by Eurozone banks documented by Hyun Song Shin. However here I want to focus on another question: how could this have been prevented? Standard macro has a simple answer: fiscal policy. The Eurozone outside Germany should have been running a much more contractionary fiscal policy in the years after its formation. If countries had done this, then a by-product would have been lower levels of debt when the global recession hit, which might have reduced the extent of the current debt crisis. But the main point is that it would have diminished the current undervaluation of Germany within the Eurozone, and so reduced the pain that countries outside Germany may now have to go through on that account. The really interesting question for me is why Eurozone countries did not pursue more contractionary fiscal policies. 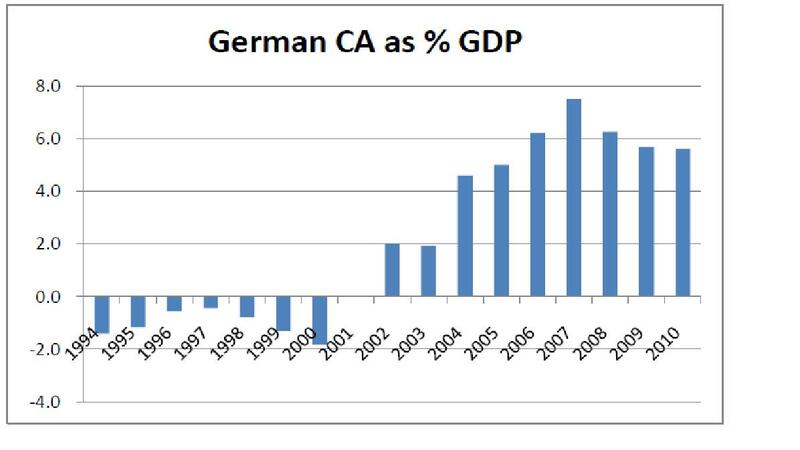 The evidence that inflation outside Germany was significantly higher than German inflation was clear enough. 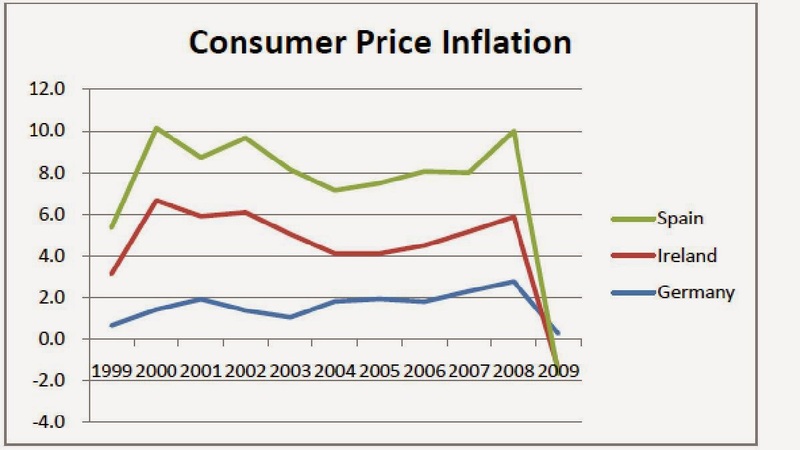 Here is consumer price inflation in Ireland, Spain and Germany, for example. We can see in 2009 the process of correction beginning, but as my earlier post showed, the correction process for the Eurozone as a whole has only just begun. In one sense the answer to my question is obvious. Contractionary fiscal policy involves higher taxes or lower government spending, and governments do not like doing this. However two other factors may have made things worse in this case. 1) In the run-up to the formation of the Eurozone, critics of the whole project focused on the costs of losing an independent monetary policy. Studies showed that an active countercyclical fiscal policy could reduce this, but significant costs remained. (Some of my own work in this area is discussed on my webpage.) One response from those arguing the case for the Euro was to deny the problem. If you deny a problem, you do not prepare for it. Why does all this matter? As everyone knows, the Eurozone is currently revamping how individual countries run their aggregate fiscal policy. With so much focus on the problem of debt rather than the problem of competitiveness, there is a danger of repeating the mistakes that were made when the Euro was formed, and ignoring the need for countercyclical fiscal policy. One alternative is to in effect hardwire countercyclical fiscal policy by creating a fiscal union, where residents in countries that are growing too fast pay taxes to those growing too slowly. But as Kevin O’Rourke pointed out, proposals at the recent summit do not involve such a fiscal union, whatever they may be called in public. It is quite likely that such a union would be politically impossible at present. If that is the case, then using fiscal policy in a countercyclical way is essential if the Eurozone is to avoid recurring crises. There is one very bad, possibly dishonest, argument for austerity today, and that is the idea that cutting government spending will have no impact on the economy, even though we are in a liquidity trap. I normally attempt to debunk this argument by going through basic macroeconomic theory to show how, in a recession with unchanged interest rates, cutting government spending is bound to reduce aggregate demand and output. (See Wren-Lewis, S (2011), Lessons from failure: fiscal policy, indulgence and ideology, National Institute Economic Review vol. 217 no. 1 R31-R46. For those who like their theory state of the art, see Woodford, M. (2011), ‘Simple analytics of the government expenditure multiplier’, American Economic Journal of Macroeconomics, 3, pp. 1–35.) The data backs up the theory when the empirics are properly done, as this nice survey by Christina Romer shows. However I have in the past had more respect for the following argument, which we might call the case for ‘precautionary austerity’. Although there are good reasons why a rapid reduction in government debt is unnecessary, financial markets do not always behave rationally. There is a chance that markets might suddenly panic, and stop buying government debt, forcing up interest rates. As the cost of such an outcome would be very high, macroeconomic policy should do everything it can to avoid it – including reducing debt rapidly - even if that meant deepening the recession. That is the argument. I was never convinced by it, partly because I think this risk is pretty small. It is certainly wrong to use the Eurozone crisis as evidence otherwise, as I’ve argued here. I also agree with a recent post by Jonathan Portes, that the musings of the credit rating agencies tell us nothing about market sentiment. However Jonathan’s post also made me wonder whether the precautionary austerity argument was simply wrong. Jonathan and others make the argument that there is no way the UK (or US) government will ever default, because they will always prefer to make their central bank buy debt through printing money. While this seemed logical, I had worried about what would happen before this point. It is unlikely that the markets would stop buying debt at any price overnight. Instead, demand for UK government debt would be positive but less than supply, and so interest rates would begin to rise. If interest rates got quite high before the central bank was forced to print money, damage could still be done. Quantitative Easing (QE) is the process by which, in the UK, the Bank of England buys government debt in an effort to reduce longer term interest rates. At the moment, every month the Monetary Policy Committee reviews not just the level of short term interest rates, but also the scale of QE. Suppose, therefore, that interest rates on government debt did start rising because the market started to panic, and yet the economy remained depressed and the outlook for inflation was benign. In these circumstances the Bank would buy government debt as part of its inflation targeting strategy. There would be no need for the government to instruct it to do so. In principle the same logic would apply to the US. If the central bank acted quickly in this way, any significant increase in interest rates would be counteracted by aggressive action by the central bank. Of course this action would involve printing money on a massive scale, but it would be temporary, and so it would not be inflationary (see here). We do not need to worry about a market panic because of Quantitative Easing. In a sense it is the counterpart to the argument that we have a Eurozone crisis because the ECB is so reluctant to act as a lender of last resort to governments. We can go further. Even when markets are behaving rationally, they don’t just worry about the fundamentals (in this case the chances of default), but also what other market participants think. If you think there are enough people in the market that might panic, it is rational for you not to buy. But if you also know that there is a residual buyer who will never panic (the central bank), you can just focus on the fundamentals, which in this case includes how long QE will exist as an option. That in turn depends on the outlook for the economy. So QE is not only the fire engine that will put out the fire, it also reduces the chances of a fire occurring in the first place. The fire engine analogy is often extended to include moral hazard: the existence of the fire engine makes house owners less cautious, so fires are more likely. But Quantitative Easing will disappear once the recovery is secure. The central bank will sell back all the debt it now owns, as Japan did in 2006. For this reason it does not remove the need for governments to control debt in the longer term. Instead it just allows them to be more flexible in the short term, while we are at the bottom of a severe recession. There have been a number of studies trying to assess how effective QE has been in keeping long term interest rates low. However perhaps it has a more important precautionary role, which is to eliminate the possibility of a self-fulfilling panic in the government debt market. But if QE does this, why do we need deep austerity now to placate the markets? When I suggest that the ECB could, in principle, end the Euro crisis by printing money (and using that money to buy government debt), a question I am often asked by non-macroeconomists is ‘will this not increase inflation’? The idea that printing money will inevitably lead to inflation is of course the monetarist position. The appeal of this idea comes from a simple thought experiment. Imagine an economy without banks, where the only money was printed by the government. People hold money because they want to buy things (money as a ‘medium of exchange’), so the demand for money is proportional to the value of overall spending. The government then doubles the supply of this money, by giving everyone a Christmas gift of cash. (This is Freidman’s famous helicopter money.) People will spend this money, because they now have more than they need. If the quantity of goods produced in the economy (‘supply’) is unchanged, we have ‘too much money chasing too few goods’, and excess demand leads to rising prices. People go on spending (the money does not get destroyed) until they have the amount of money they need, which is the same proportion of the total value of spending. The process will only stop when everything costs twice as much. This is the famous ‘neutrality of money’. The neutrality of money is a very robust proposition. For those mathematically inclined, imagine a set of equations that describe the real economy (output, real wages etc). This real economy includes ‘real balances’: the purchasing power of money, or money divided by prices. Now suppose the government has control of one nominal quantity, money. If we start from an equilibrium where all the equations hold, and double money, then the set of equations will also hold for the same set of real quantities plus a doubled price level, because this gives us the same level of real balances. Now monetarists have always understood that the process from doubling money to doubling prices may take time. 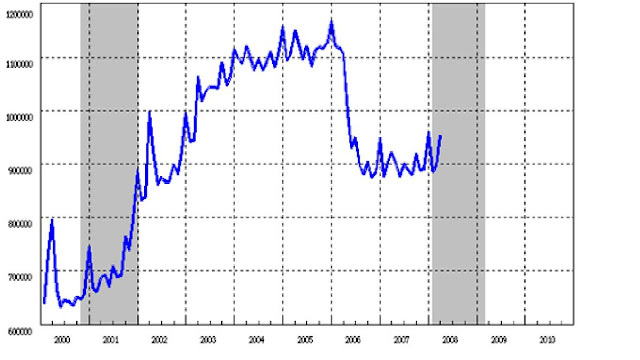 Furthermore, the assumption that supply remains unchanged may not be correct if we start with unemployed resources (i.e. a recession). Freidman was highly critical of the Federal Reserve in the Great Depression for not printing enough money. However, if in time unemployed resources disappear, any additional money will lead to higher prices. The thought experiment above involved the government giving people money. But that combines monetary and fiscal policy: it is like a tax cut financed by printing money. A pure monetary policy operation would involve the central bank using its newly printed money to buy assets like government debt. This is what we now call quantitative easing. The neutrality of money idea should still work, because by buying assets the bank raises their price, which lowers interest rates, which encourages more people to borrow and spend. But suppose interest rates have hit a zero lower bound i.e. we are in a liquidity trap. The problem now is that the central bank is swapping money for assets that pay the same as money (because interest rates are zero), so nothing has really happened. There is a lot more to say about whether Quantitative Easing will work in stimulating the economy, but at best that is what it will initially do – output will rise because there are unemployed resources, and prices will not. This is why the Bank of England and the Federal Reserve have printed money like crazy over the last few years. But when the economy recovers, will not the chickens eventually come home to roost? Inflation must increase in the end, surely – that’s what neutrality implies. But our thought experiment assumed that the money would stay doubled in quantity. A sensible central bank, one the economy recovers, will begin to contract the money supply. Job done, so back to business as usual. If the central bank has bought lots of government debt, it can start selling it. The central bank can certainly start raising interest rates above zero, which will encourage people to switch out of money. So the money supply will shrink back down. This is just a rather elaborate way of saying that printing money need not be inflationary because it can be temporary. Those who argue that printing money must be inflationary are making an implicit assumption that the extra money is permanently with us, and this is an assumption that need not hold, particularly if monetary policy is in the hands of an inflation targeting independent central bank like the ECB. 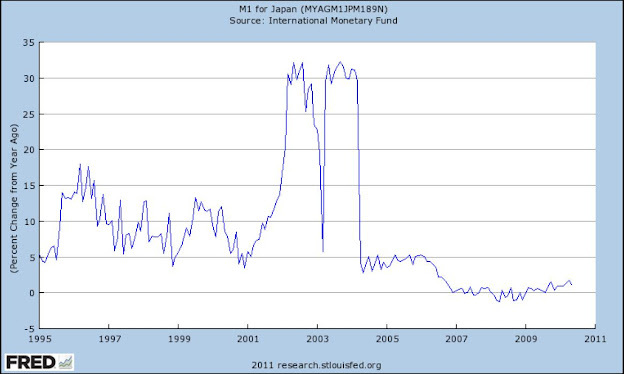 If this all sounds too abstract, here is what happened to money (in this case M1) in Japan in the early years of this century. In an effort to boost the economy the Japanese central bank tried a programme of Quantitative Easing, leading to rapid growth in narrow money. 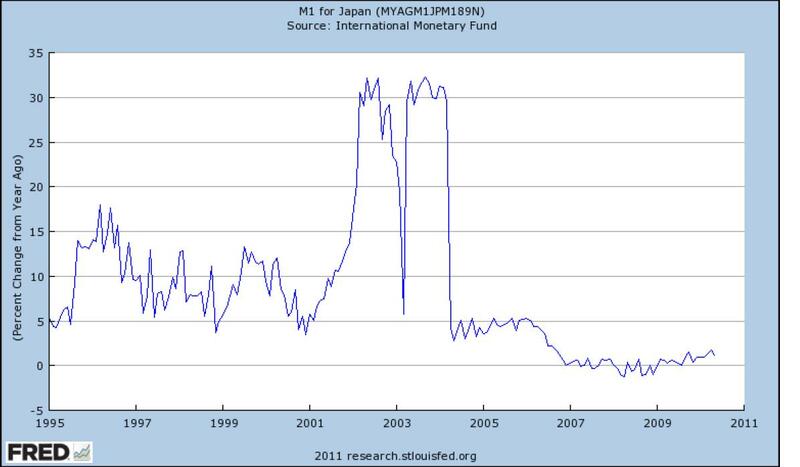 Japan was also in a liquidity trap, so broader definitions of money did not increase that much. 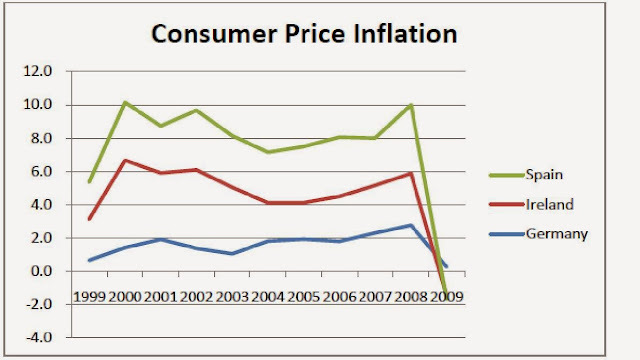 However inflation did not increase: on average inflation has been zero between 2003 and today. How much it helped expand the economy is still unclear. Below is a graph of the level of the monetary base – the money the central bank actually prints. 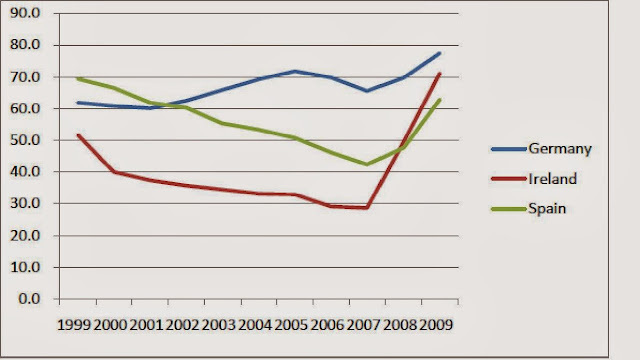 The expansion in 2003 is clear, but so is the contraction in 2006, when the experiment ended. The bottom line: printing money can be temporary, and will not be inflationary in a recession. Is there a Competitiveness Problem within the Eurozone? Many economists, including myself, have argued that there are two crises in the Euro area right now. The one everyone knows about involves government debt. But the other involves competitiveness. Most Eurozone countries (let’s call them non-Germany for short) have allowed their inflation rates to exceed German inflation for a sustained period, which means they are now seriously uncompetitive relative to Germany. This situation will inevitably correct itself. However if German inflation remains low, correction will involve a period of static or falling prices for non-Germany. From experience we know this can only be achieved by high unemployment and low, possibly negative, growth in non-Germany. As a result, many Eurozone countries might be facing or experiencing a recession even if there was no debt crisis. But does the data support this proposition, which we might call the ‘current misalignment’ hypothesis. The chart below looks at relative unit labour costs (a measure of competitiveness often used by the OECD, whose Economic Outlook is the source for this data) for Germany and the Eurozone as a whole. The level of either series is arbitrary – its changes that matter. German competitiveness has stayed fairly constant over the last twenty years, but Euro competitiveness has declined sharply since its formation. 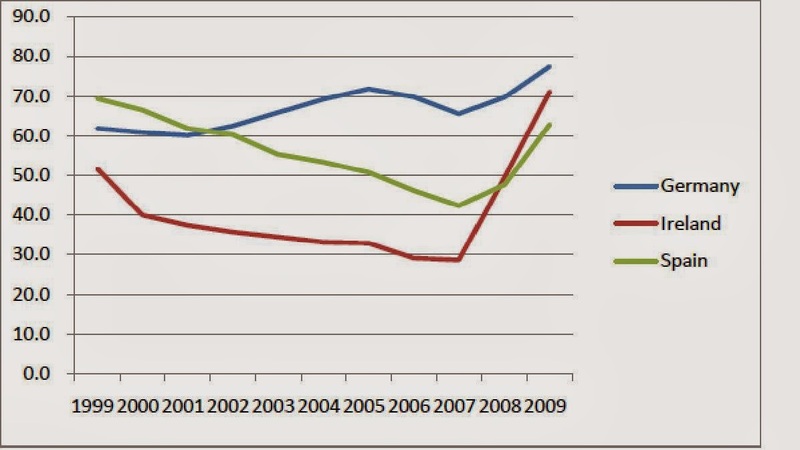 This implies an even larger competitiveness decline in non-Germany. 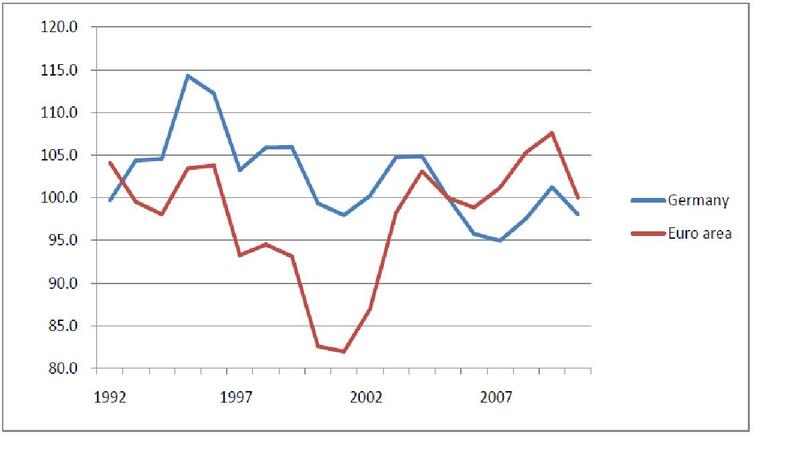 So movements in competitiveness since 2000 are clear. However there is an alternative to the current misalignment hypothesis. It could be that the Euro started with an uncompetitive Germany, because Germany joined at an overvalued exchange rate. Let’s call this the ‘past misalignment’ hypothesis. Perhaps what we see now is a return to sustainability rather than a movement away from it. 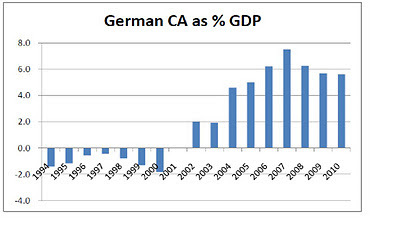 The chart indicates this possibility, with non-Germany gaining competitiveness between 1992 and 2000. Unfortunately we cannot make the assumption that competitiveness always reverts back to some constant level. 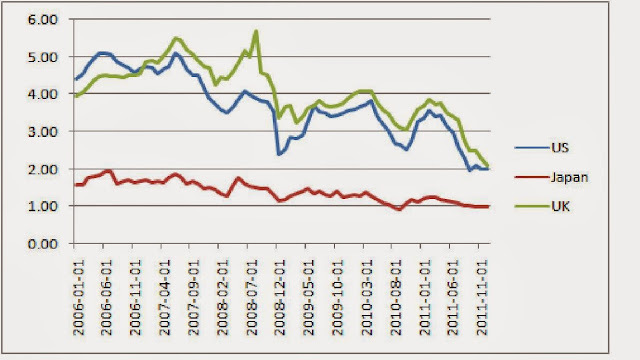 For reasons that we do not fully understand, what we call equilibrium real exchange rates (trend or sustainable competitiveness) can show trends over time. So how do we judge what level of competitiveness is sustainable, and what is not? In 1998 I published some work with Rebecca Driver that estimated equilibrium exchange rates for the year 2000. The equilibrium rates we calculated for the Franc/DM and Lire/DM turned out to be close to their Euro conversion rates. This suggests no German misalignment when the Euro was created. At its most basic, what this study did was to look at current accounts. If a country is too competitive (its exchange rate is undervalued) it will run a current account surplus, and vice versa. The chart below shows a sharp switch from small deficits to large surpluses in the German current account after the formation of the Euro. Non-Germany shows the opposite pattern. If (and this will be a big if) a sustainable exchange rate is associated with current account balance, then this evidence strongly supports the current misalignment idea. Many have argued (e.g. Martin Wolf in the Financial Times) that current accounts indicate that the Eurozone does indeed have two crises at present. Daniel Gros goes further, and suggests external debt is the key to the current turmoil in European economies. But is a current account surplus or deficit a sure fire indicator of unsustainable competitiveness? As the current account represents changes in national wealth, we would expect that in a very long run equilibrium the current account should balance. However that is not the case over periods of, say, a decade or two. There are many examples of countries that run persistent current account surpluses: Japan is the obvious example. We understand some reasons why this might happen: a country may have a demographic structure where there are more savers than borrowers (with the opposite bias overseas). Perhaps the formation of the Euro started a period where more capital flowed from the richer to the poorer Euro economies. But if that were the case, would we not also expect surpluses in France, whereas what we find are deficits. Some arguments go the other way. If the need for fiscal consolidation was greater in non-Germany than Germany, this might imply that non-Germany would run larger current account surpluses for some time. Empirical evidence is rarely clear cut in macro. We cannot know for sure that over the next decade or two Germany will not continue to run large surpluses and non-Germany deficits. But – based on the evidence that I have seen – it does seem unlikely. This past misalignment story seems less plausible and the current misalignment hypothesis more credible. Some interesting implications follow, which I intend to explore later. I’ve occasionally written short pieces for my homepage that reflect on current macro events, policy or theory. They are often provoked by apparent disagreement among macroeconomists: whether to raise UK interest rates in early 2011 was one recent example. They are the kind of thing you find in newspaper articles, but which I have not tried to place there either because I did not have time, or because how you go about doing this remains mysterious to me. However there are many occasions where most macroeconomists agree on what is going on or what should be done, but that message does not feature sufficiently in the public debate. Rather than shout once more at the TV screen or radio, I thought I would start a blog. Here is one example I heard today, but which has been repeated over and over again when discussing the reaction of Eurozone policymakers to the current crisis. Whatever measures are being taken to reduce budget deficits, in either particular countries or by changing Eurozone rules, it is often asked ‘will this convince the markets’. The clear implication is that with enough austerity, markets will happily go back to buying debt without demanding high interest rates to compensate for default risk. So the impact of any policy measures will depend on whether it convinces the ECB to act as a lender of last resort. Crucial, therefore, is what the ECB thinks. Is the ECB waiting for enough to be done before providing a strong market signal, or is it fundamentally opposed to acting as a lender of last resort? A third possibility is that it is playing a game whereby an on-going crisis is necessary to apply continuing pressure to reduce budget deficits. Why is it important to mention the ECB in any discussion linking policy actions to interest rates on government debt? Because it highlights the role of an (unelected) economic institution that we hope is acting in the Eurozone’s best interests, but could instead be acting in a dangerous manner because of a distorted macroeconomic viewpoint. Unless we know for certain that the first of these alternatives is true, we might well ask whether it is wise to rest such power in the hands of a small group that appear democratically unaccountable. I’m not sure what the answer to this question is, but I think it is a question that should be asked more often. So, this is why I’m starting a blog. I regard my own views as fairly mainstream, although what is mainstream and what is not is sometimes unclear even to economists, and much less clear in the media. I’m certainly not the most brilliant or exciting macroeconomist in the UK at the moment, but I like to think that I have done enough in the past in contributing to the academic and policy debate to know when I have something interesting or important to say, or when I should stay quiet and do some more thinking. I hope the entries will by and large be accessible to non-economists, although hopefully of some interest to economics students and maybe even academic colleagues. If they are technical, I will try and signal this at the start.